Crowds queue up outside the Huntsman Center at the U. to hear the Tibetan leader speak. 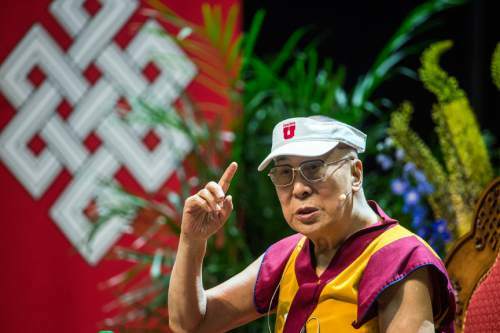 Chris Detrick | The Salt Lake Tribune The Dalai Lama speaks at the Huntsman Center at the University of Utah Tuesday June 21, 2016. 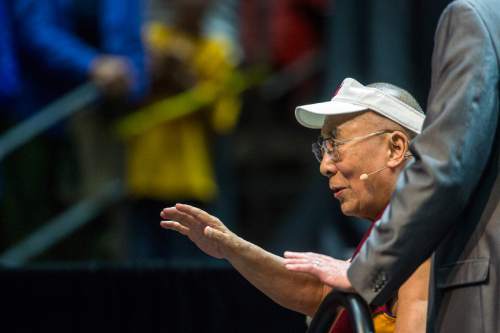 Chris Detrick | The Salt Lake Tribune The Dalai Lama speaks at the Huntsman Center at the University of Utah Tuesday June 21, 2016. 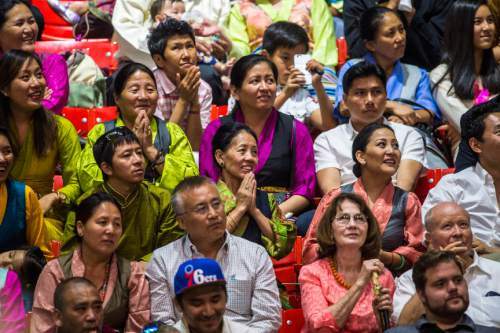 Chris Detrick | The Salt Lake Tribune Members of the audience listen as the Dalai Lama speaks at the Huntsman Center at the University of Utah Tuesday June 21, 2016. 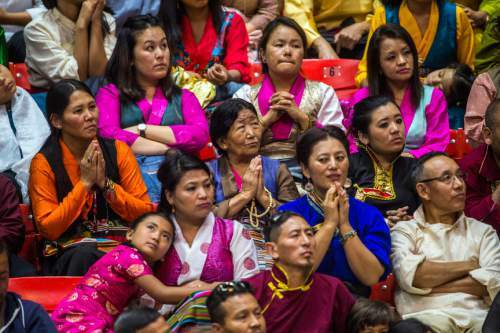 Chris Detrick | The Salt Lake Tribune Members of the audience listen as the Dalai Lama speaks at the Huntsman Center at the University of Utah Tuesday June 21, 2016. 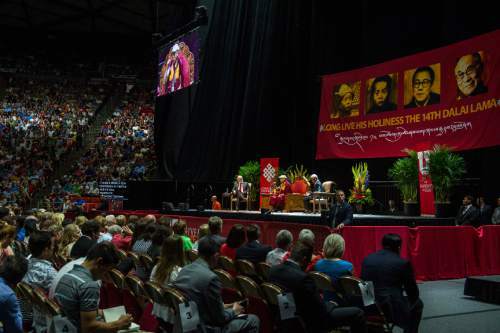 Chris Detrick | The Salt Lake Tribune Members of the audience listen as the Dalai Lama speaks at the Huntsman Center at the University of Utah Tuesday June 21, 2016. 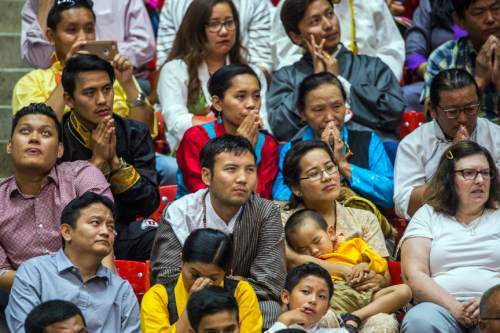 Chris Detrick | The Salt Lake Tribune Members of the audience listen as the Dalai Lama speaks at the Huntsman Center at the University of Utah Tuesday June 21, 2016. Chris Detrick | The Salt Lake Tribune Pamela Atkinson greets the Dalai Lama at the Huntsman Center at the University of Utah Tuesday June 21, 2016. Chris Detrick | The Salt Lake Tribune The Dalai Lama speaks at the Huntsman Center at the University of Utah Tuesday June 21, 2016. 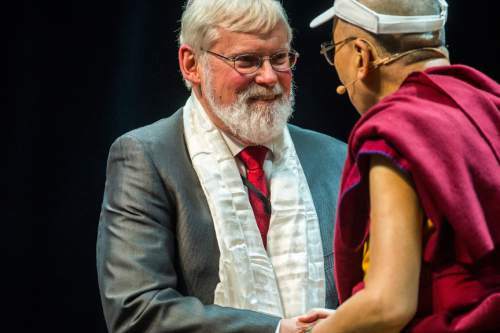 Chris Detrick | The Salt Lake Tribune University of Utah President David Pershing greets the Dalai Lama at the Huntsman Center at the University of Utah Tuesday June 21, 2016. Chris Detrick | The Salt Lake Tribune The Dalai Lama speaks at the Huntsman Center at the University of Utah Tuesday June 21, 2016. Chris Detrick | The Salt Lake Tribune The Dalai Lama speaks at the Huntsman Center at the University of Utah Tuesday June 21, 2016. Chris Detrick | The Salt Lake Tribune The Dalai Lama speaks at the Huntsman Center at the University of Utah Tuesday June 21, 2016. Chris Detrick | The Salt Lake Tribune The Dalai Lama speaks at the Huntsman Center at the University of Utah Tuesday June 21, 2016. Chris Detrick | The Salt Lake Tribune The Dalai Lama speaks at the Huntsman Center at the University of Utah Tuesday June 21, 2016. Chris Detrick | The Salt Lake Tribune The Dalai Lama speaks at the Huntsman Center at the University of Utah Tuesday June 21, 2016. Prayer, he said, is not the answer. 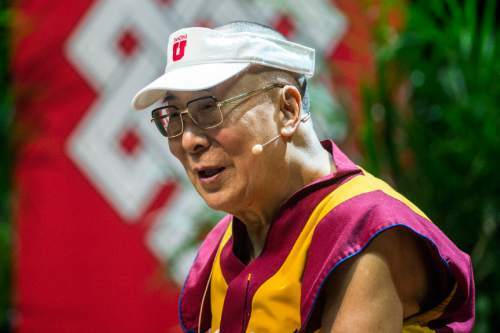 "I am a Buddhist, and prayer is part of my daily practice," the charismatic Tibetan told a nearly full Huntsman Center at the University of Utah. "Individual prayer is relevant and useful. For society and the world, though, prayer is not meaningful." Peace, the mustard-and-maroon robed monk emphasized, "comes through actions." The good news, His Holiness the 14th Dalai Lama added, is that humans have compassion within them. It took only a few minutes after his arrival for the 80-year-old Nobel Peace Prize winner to win over the crowd with his grin, his unexpected chuckle, his enthusiasm and his informality. 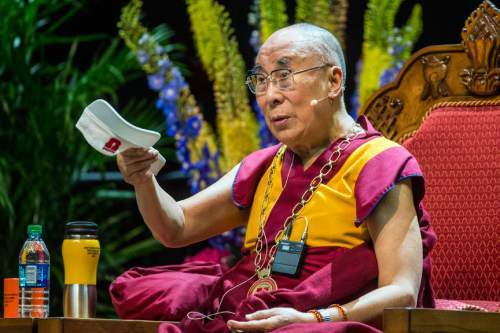 As he stepped up to the platform, with its handwoven carpet, tall, potted plants, and specially made Tibetan throne, the Dalai Lama greeted his listeners with a "hello"  and a laugh. He then faced each quadrant in the arena, his hands pressed together, and bowed in a gesture of respect before taking his seat. U. 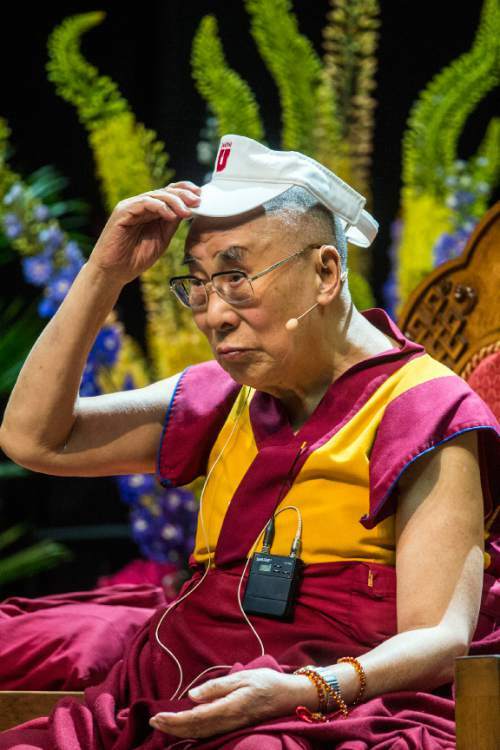 President David Pershing announced that the state&apos;s flagship school was awarding the Tibetan leader its highest honor, the Presidential Medal, but he said the Dalai Lama wouldn&apos;t have to wear it because the medallion hangs from a heavy chain. The Buddhist leader immediately put the medal around his neck. "No, no. Not heavy," he said. "Now give me that hat." He then donned a white cap sporting a red "U." 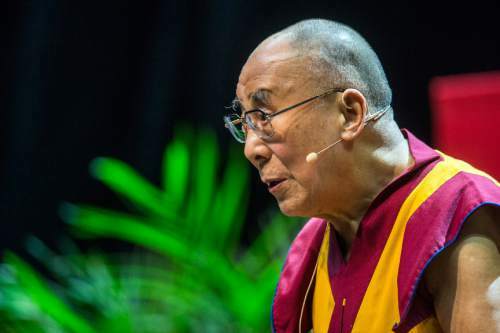 The Dalai Lama began his speech by saying that he does not consider himself special  just a "simple monk." "We are the same as humans  the audience, the speaker, we are the same emotionally, mentally and physically," he said. "Everyone wants a happy life. … And everyone has the right to have that desire." All violence and war, he stated, come from a self-centered attitude that doesn&apos;t care about others. "Logically, who creates violence, who destroys peace, is not God, but you," he said, "and you have a responsibility to stop war." More than 200 million people died violently in the 20th century, the Dalai Lama lamented. "We need to create a better relationship on this planet. … Today&apos;s reality must change. We cannot do it with old thinking. ... We must create a new way of thinking, offering a global message" that transcends national boundaries. For his part, the Tibetan leader is hopeful  especially about the rising generations. He is working on an educational curriculum to address modern problems built on "moral ethics," he said, "not on a religious approach." The spiritual leader of all Tibetans worldwide then spoke in his native tongue directly to those from his homeland in the arena. "He advised the Tibetans to take pride in the fact that [they] are the custodians of … classical Buddhist heritage," his interpreter explained. "It is almost like the life force of the Tibetan people. … It emphasizes critical reasoning and thinking. … They should recognize canonical contributions, not as sacred texts, but as textbooks of study." 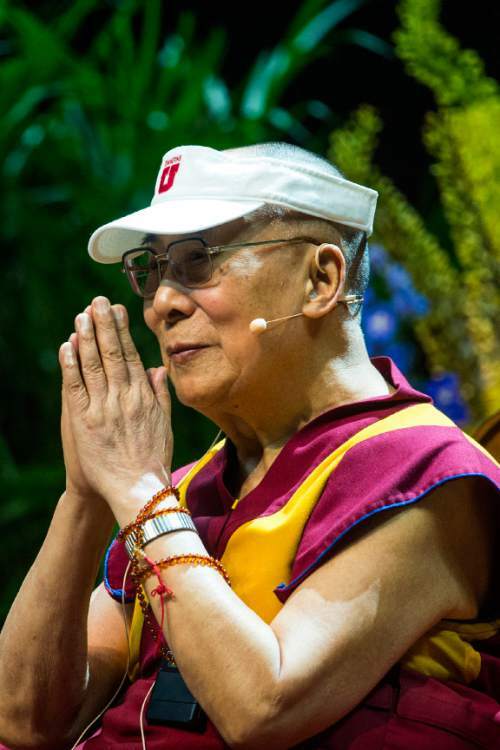 "I am nearly 81," the Dalai Lama said, "but I consider myself still a student." He assured the Tibetans that Utah was a nice place to settle. "When you made the choice to make it your second home, you haven&apos;t made a mistake. It&apos;s very beautiful." Turning again to all the audience members, he urged them to make every effort to create a happier, more compassionate world. "My brothers, my sisters, you should not think of world problems as huge and that one individual cannot do much," he said. "This is wrong thinking." A peaceful world starts with one person, then one family, then 10 families, then 1,000 families and whole communities. "That&apos;s the way to change society," he said. "I feel it in my heart." After basking in a standing ovation, the Dalai Lama slowly stepped off the platform via a set of stairs. "The knees are not so good," he quipped. "But you can stay young if you keep your mind open." Earlier Tuesday, the spiritual leader blessed patients at the Huntsman Cancer Institute. "It was my pleasure to be in the presence of His Holiness and to physically feel peace and harmony as he shared his thoughts on teaching human values and inner happiness," Emma Houston, a breast cancer survivor, said in a news release from the institute. The Dalai Lama, who visited Utah in 2001, also had lunch at the Grand America Hotel with hundreds of guests and dignitaries, including Gov. Gary Herbert, Salt Lake City Mayor Jackie Biskupski, Salt Lake County Mayor Ben McAdams and 2012 Republican presidential nominee Mitt Romney. But the main event was the afternoon speech at the U., where crowds queued up outside the Huntsman Center, waiting to pass through metal detectors. 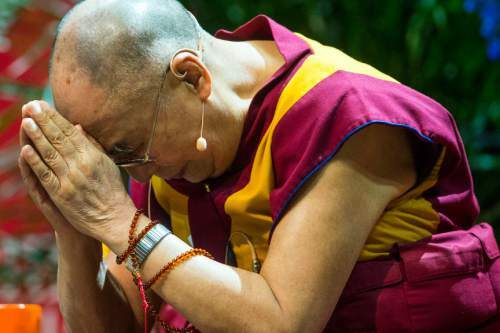 "Wherever His Holiness goes, he sends a message of peace. 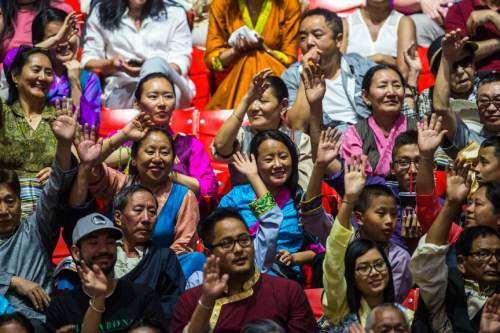 It is especially important for the younger generation," said Lobsang Tsering, a native of India and now president of the Utah Tibetan Association. "... A lot of people are stressed out, and his message for us all is especially important these days." On Wednesday, he plans to meet with a Mormon apostle and visit a new Tibetan cultural center in South Salt Lake. Tenzin Zangma, a representative of the Utah Tibetan Association, is eager to show off that facility. "He hasn&apos;t been here in so long," said Zangma, wearing a traditional western Tibetan chupa. "Now we have a new community center that just opened that everyone worked so hard on." Her grandparents fled Tibet when China took over in the 1950s, trekking across the Himalayas into India. Her family members then made their way to the United States. "We are really grateful for the American government and people letting us establish communities here," Zangma said. "... Because there are so few Tibetans in Utah, it&apos;s a very tight-knit community. Our community center is going to be the backbone." 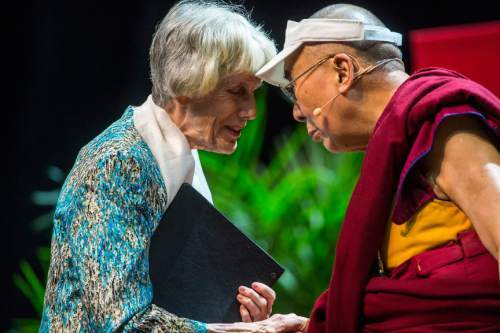 She is especially grateful for the Dalai Lama&apos;s return to Utah after a 15-year absence "when I&apos;m older and wiser." No "free Tibet" protesters or other demonstrators were present outside the Huntsman Center. "The Tibetan government in exile does encourage us to keep it pretty neutral," Zangma said. "There are a lot of people who do want to free Tibet, but all Tibetans in general would like to see greater freedom, both religious and political." Aileen Enriquez Palmer traveled from Calgary, Alberta, to hear the Dalai Lama. "Just listening to him speak is part of my bucket list," said the 39-year-old. "I&apos;ve been spending a lot of time just learning the teachings of Buddhism and meditation, and I just love the lessons."  Tribune reporter Jill Castellano contributed to this story.